JCB: Williams is your classic tragic hero, but I’ve crafted his story where some people may not perceive him as flawed at all. There are always different facets of a person’s character based on a variety of factors, including one’s experience. Combining his backstory with the fear of being hunted by the unknown really highlights his character. Though he was present during the My Lai Massacre, he didn’t participate in it, but he also didn’t use his rank to order those soldiers to stand down from attacking innocents. Does that make him bad? The vast majority of us never experienced the horror of the Vietnam War, so who are we to judge when those soldiers watched their friends beheaded by supposed guides. 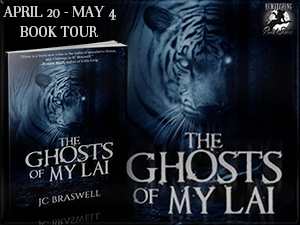 It’s titled The Ghosts of My Lai for a variety of reasons. One is obvious—that fact that someone or something is hunting him as he leads his troops through unknown jungle. The other reasons are less obvious. JCB: I believe in a spiritual world if that’s what you mean by paranormal. I think we’ve all experienced something we can’t explain, but in a world of science people dismiss odd occurrences as nothing. SC: . What titles are you working on now that you can tell us about? JCB: I’m working on the second novel in a series I released last year. The first book is titled Reignfall. It takes place shortly after America recovers from a second Black Bubonic Plague. The Plague wiped 75% of the world’s population, leaving most countries decimated. The only cure happens to stop the aging process but also renders females sterile. I have a whole section of my website dedicated to the saga at www.jcbraswell.com. I have a second short story being released by Scarlet Galleon Publishing this fall. It’s about Scottish folklore. I’m really excited about it because it’s so unique and because of the other authors who are involved with these anthologies. It’s really an honor. I also have other books I’ve drafted over the past several years. One involves a haunted school that sits on land with a sordid past. We might be seeing that one soon as well. THANKS TO JC BRASWELL FOR STOPPING BY!